Department of Chemistry, College of Basic Science, Yadegar -e- Imam Khomeini (RAH) Shahr-e-Rey Branch, Islamic Azad University, Tehran, Iran. The efficient application of the photocatalytic activity and superficial adsorption on removing heavy metals from water, two types of sorbents, Nd-TiO2/bentonite and Ce-TiO2/bentonite nanocomposites, were synthesized by sol-gel method. The crystalline nanocomposites were obtained after heat treatment at 500 °C for 3 hours. The results of scanning electron microscopy (SEM) indicates that Nd-TiO2/bentonite and Ce-TiO2/bentonite were produced on a nanoscale. The phase change of both nanocomposite from amorphous to anatase has been investigated by X- ray diffraction. Removal of lead (II) and cadmium (II) were studied through adsorption on these nanocomposites by letting them float in the bulk of sample for a definite time in presence and absence of light. The effective parameters in removal process were studied and optimized. The optimum pH, removal time and sorbent dosage in the absence and presence of light for Pb2+ ion were 7, 0.3 g, 15 min and for Cd2+ ion were 7, 0.4 g, 20 min, respectively. Subsequently, the effect of interfering ions in removal process was investigated at optimum conditions and no evidence of interference was observed. The study showed that reproducibility of method (n=9) is good and suitable. The results further indicated that the removal efficiency of Pb2+ ion with Nd-TiO2/bentonite in the presence of light was more than that in the absence of light. Finally, the equilibrium adsorption data fitted Freundlich and Langmuir adsorption models. Exposure to heavy metals, even at the trace level, is believed to put human health at risk . Thus, exploring effective methods and applying efficient techniques have constantly been essential. [2,3]. Nowadays, numerous methods have been proposed for efficient heavy metal removal from water, including, cementation  electrodeposition , ion exchange , precipitation , etc. However, among these methods, adsorption offers flexibility in design, operation and, in many cases it will generate high-quality treated effluent. Therefore, the adsorption process has come to the forefront as one of the major techniques for heavy metal removal from water/wastewater. Extensive research studies have been carried out on the inexpensive and effective methods of natural adsorbents in order to remove heavy metal ions from water, such as: activated sludge biomass , natural and synthesized clay [8,9]. Nevertheless, in recent years, new adsorbent has been produced by nanotechnology with high specific surface area and inordinate performance . Inorganic hybrid polymers have enhanced variety of applications including ability of heavy metal ion removal by nanosorbents . Sol-gel method have been used for synthesis of inorganic hybrid materials and mesomorphous compounds. The nanoparticles used in these hybrids are: SiO2 , Al2O3 , Fe3O4 , ZnO , ZrO2 , CdS , and TiO2 [18,19]. In fact, since TiO2 as an inorganic compound among the aforementioned nanoparticles is nontoxic, super hydrophilic, photocatalytic activity and it has relatively high resistance in acidic and alkaline pH. Titania has the ability to adsorb heavy metal ion from aquatic media . The standard reduction potential of the metals affects the photocatalytic activity of TiO2 in anatase crystal structure and it would affect the metal ion removal process, too. In addition, the kind of ion doped would affect photocatalytic ability of titania and consequently, the metal removal process as well [21,22]. Montmorillonite is a very soft phyllosilicate group of minerals that typically form as microscopic crystals, known as clay. Montmorillonite clay minerals have exclusive structure with numerous applications . Bentonit contains a high amount of swelling montmorillonite clay . Its composition entails SiO2, Al2O3, CaO, Na2O, MgO, Fe2O3, and K2O . There are two types of bentonite that are accessible. One of them is sodium bentonite and another calcium bentonite. Sodium bentonite has higher swelling ability therefore, higher surface area that turns it to a good and efficient sorbent . In this investigation, the effect of doped ion on the ability of M-TiO2/bentonite nanocomposite to initially remove Pb(П) and Cd(П) was studied and then the parameters affecting the elimination process were optimized. Bentonite was purchased from Pishgaman Fanavari Co. Titanium tetra isopropoxide (TTIP), Neodymium(III) acetate and (NH4)2Ce(NO3)6 (with AR analytical grade, Merck Chemical Company) were used as Titanium, Neodymium and cerium sources for the preparation of the Nd-TiO2 and Ce-TiO2 nanocomposites. CaCl2, PbCl2, HNO3, NaOH, Hydroxy Propyl Cellulose (HPC), MgCl2, Ni(NO3)2.6H2O, CuCl2.2H2O were all purchased from Merck Company. All chemicals were analytic grade and used as received without further purification. A photocatalytic reaction system was used to study the photocatalytic activity for the removal of heavy metal ions and its details were described elsewhere [26,27]. In summary, borosilicate container with an effective volume of 300 ml was used to store the sample that was cooled by water throughout the experiment (the temperature was adjusted to 25 °C). High pressure mercury vapor lamp (400 W) was mounted on top of the container as a radiation source. In order to evaluate the ability of synthesized nanocomposites in separation of lead and cadmium ions, 100 ml solution with , 5ppm lead and 2 ppm cadmium made separately and then at pH=7 for 20 minutes was placed in contact with 0.3 g of Nd-TiO2/bentonite or Ce-TiO2/bentonite nanocomposite, in the presence and absence of light. The nanocomposites were prepared based on the method of Zhao and et al. . To synthesize nanocomposites, the solution 1 was prepared by TTIP/ EtOH/ HPC with molar ratio 1/126/4.5 ×10-3 g/gsol. Afterward another mixture of EtOH/H2O/HNO3/ion doped with molar ratio 42/1/0.2/0.002 was prepared (solution 2). Solution 1 under vigorous stirring by ultrasonic apparatus was added dropwise to the solution 2 and mixing with in 5 min. To create a gel, the solution aged for 48 hours at room temperature (Solution 3). 2 g bentonite soil was placed in the oven at 550 °C for 3 hours, until it burned all organic compounds and impurities removed. After cooling, a small amount of deionized water was added to the soil mixture to reach saturated bentonite soil. Then solution 3 was added to reach saturated bentoinite soil and stirred for 1 hour. The obtained sample was dried at room temperature and calcined at 500 °C for 3 hours in the furnace. After cooling, the target sample was ground to the fine particles by a Planetary Ball Mill and was kept for further testing. Surface morphology of bentonite, synthesized nanocomposites and EDX analysis were studied by SEM model TE scan company vega2. The crystal structure of the samples was determined by XRD analysis with GNR apparatus (NPB3000 model). Flame-Atomic absorption spectroscopy (F-AAS, Varian) was used for the quantitative determination of Pb2+ and Cd2+ ion concentration. SEM images of bentonite and synthesized nanocomposites are shown in Figs. 1(a), 1(b), and 1(c). Figs. 1(a) shows a layer state of bentonite soil perfectly. According to Fig. 1(b), formation of Nd-TiO2 nanoparticles have been well-defined with 25 nm particle size on bentonite layers. Meanwhile, the distribution range of particle size was minimal and monotonous formation of nanoparticles were recognizable. Fig. 1(c) shows SEM image of Ce-TiO2/bentonite nanocomposite. Despite the formation of smaller particle (approximately 16 nm), it is getting more agglomeration than the previous nanocomposite. Thus, it can be concluded that the change in ion-doped toTiO2, not only influences the size of particle but also the uniform and agglomeration of composed nanoparticles. Results of EDX analyses of bentonite and sample nanocomposites are shown in Figs. 2(a), 2(b), and 2(c). Fig. 2(a) shows the elements in used bentonite. Figs. 2(b) and 2(c) are display of elements in Nd-TiO2/bentonite and Ce-TiO2/bentonite nanocomposites, respectively. They not only indicate the existence of Ti but also the doped ions and bentonite elements. Bentonite and synthesized nanocomposites XRD patterns are shown in Figs. 3(a), 3(b), and 3(c). Fig. 3(a) illustrates bentonite XRD patterns and confirms montmorillonite at 2θ =7°. Figs. 3(b) and 3(c) show XRD patterns of Nd-TiO2/bentonite and Ce-TiO2/bentonite nanocomposites, respectively. As specified in images, the formation of nanocomposite causes montmorillonite peak shifts from 2θ =7° to 2θ =9°. This can prove formation of the target nanocomposits. The peak intensity of bentonite has been reduced due to the perch of Nd-TiO2 or Ce-TiO2 nanoparticles on the bentonite surface. On the other hand, the peak at 2θ =25° shows in 3b and 3c, confirming TiO2 anatase phase. In addition, peaks associated with neodymium and cerium in these results also confirm the existence of ions doped in the synthesized nanocomposites. The anatase phase formed in two synthesized nanocomposites is relatively significant. Therefore, it is expected that TiO2 is not only used in adsorption of heavy metal ions, but also is decomposed of organic compounds pollutant such as dye, in water with photocatalytic activity [28,29]. Parameters affecting the lead and cadmium ions adsorption by synthesized nanocomposites were investigated and optimized. These parameters are pH, removal time, and amount of sorbent. Besides, the effect of interfering ions in the lead and cadmium ions removal process were investigate Variation in selected ion concentrations was monitored by using a flame-atomic absorption spectrometer. Lead and cadmium ions precipitate in an alkaline environment as a hydroxide form. Thus, pH survey was applied acidic to neutral range. To this end, 0.3g of nanosorbents were added separately to the 100 mL solution containing 5 ppm lead and 2 ppm cadmium in the pH range of 2 to 7 and was stirred for 20 minutes. Results are shown in Fig. 4(a), 4(b), 5(a) and 5(b). Fig. 4(a) illustrate pH effect on separation of lead ion by Nd-TiO2/bentonite nanocomposite in the presence and absence of light and Fig. 4b shows same effect on separation lead by Ce-TiO2/bentonite nanocomposite. According to the Figs., highest removal efficiency in presence and absence of light occurs at pH=7. By comparing the results it is clear that the presence of light in the removal of lead (II) ion by Nd-TiO2/bentonite nanocomposite affected and removal efficiency can be improve, while have a negative effect on ions removal by Ce-TiO2/bentonite nanocomposite. Fig. 5(a) illustrates the impact of pH on cadmium ion separation by Nd-TiO2/bentonite nanocomposite in the presence and absence of light while Fig. 5(b) shows the same effect on the separation of cadmium ion by Ce-TiO2/bentonite nanocomposite. The negative impact of light on cadmium ion removal by Ce-TiO2/bentonite nanocomposite has been observed. On the other hand, the influence of neodymium ion as a doping agent than cerium ion on the removal efficiency of lead ion was positive and improve the removal efficiency ion. Lead and cadmium ions removal experiments in pH=7 and previous condition ,were repeated separately with various amounts of 0.1, 0.2, 0.3 and 0.4 g of synthesized nanocomposites in the presence and absence of light. The results are depicted in Figs. 6(a), 6(b), 7(a) and 7(b). Figs. 6a and 6b show the results of lead (II) ion removal by Nd-TiO2/bentonite and Ce-TiO2/bentonite nanocomposites in the presence and absence of light, respectively. In all cases, the optimal amount of sorbent was considered 0.3 g. Increasing the amount of sorbent had no significant impact on improving the efficiency of removal, because almost all lead ions are adsorbed on the nanocomposite surface at 0.3 g.
Figs. 7(a) and 7(b) show the results of cadmium ion removal by Nd-TiO2/bentonite and Ce-TiO2/bentonite nanocomposites in the presence and absence of light, respectively. The optimal amount of sorbent for cadmium ion was considered 0.4 g. As the results show, the removal efficiencies of both ions by Nd-TiO2/bentonite nanocomposite is higher in the presence of light. In addition, when the neodymium is used as a doping agent, either in the presence or absence of light, lead removal efficiency is higher than the cerium is a doping agent. But this effect on cadmium ion removal is not acceptable and different removal rates of the nanocomposites doped with Nd3+ (49 %) and Ce4+ (50%) is very small and can be neglected. Thus, it can be concluded that the ion doped in to titania can influence ion removal capability of synthesized nanocomposites. Nonetheless, this change also depends on the type of ion removal process. These probably can be attributed to the influence of ion doped on TiO2 energy gap that affects its ability to remove various ions. Adsorbent contact time with the target ion is one of the important factors in the ion removal process. Therefore, times 5, 10, 15 and 20 minutes are tested for lead (II) and cadmium (II) ions removal, separately. The results are presented in Figs. 8(a), 8(b), 9(a) and 9(b). Figs. 8(a) and 8(b) show the result of Pb2+ ion removal by Nd-TiO2/bentonite and Ce-TiO2/bentonite nanocomposites in the presence and absence of light, respectively. According to Figs. 9(a) and 9(b), the consequence of Cd2+ ion removal by Nd-TiO2/bentonite and Ce-TiO2/bentonite nanocomposites in the presence and absence of light, can be observed respectively. The results show that the optimum time for the lead ion removal by both nanocomposites is 15 minute and for cadmium ion removal is 20 minute. As the results illustrates, extending the time does not greatly change the effniciency level of cadmium ion removal by both nanocomposite samples. However, extending the process time than 15 minute, will decrease the efficiency of lead ion removal process by Nd-TiO2/bentoniteand and Ce-TiO2/bentonite nanocomposites. Thus, it can be concluded that the adsorption of lead ion by nanocomposites was physisorption and extended contact time can reduce the lead ions and can decrease the removal efficiency. However, due to the strong cadmium adsorption of both nanocomposites, it can be concluded that adsorption was chemisorption, and the adsorption efficiency can not only remain constant but also partially increase. Note that removal efficiency of both ions by Nd-TiO2/bentonite nanocomposite will significantly increase in the presence of light than the absence of that. None the less, the effect of neodymium ion, as a dopant ion rather that a cerium ion, on the lead and cadmium ions removal efficiency was optimistic and would increase the removal effectiveness of both ions. The adsorption capacity (Q) in maximum percent removal is respectively 158 and 136 mgPb2+/gsorbent for Nd-TiO2/bentonite and Ce-TiO2/bentonite. The Q is respectively 36 and 42.5 mgCd2+/gsorbent for Nd-TiO2/bentonite and Ce-TiO2/bentonite. In the adsorbent ion removal phenomenon, the presence of other ions can affect the removal efficiency of the target ion. If the interfering ions could affect the elimination signal less than ±5%, Interference effects were negligible and would not be considered. Therefore, the ions Ca2+ , Ni2+ , Cu2+ and Mg2+ 200 ppm, considered as interfering ions in order to remove lead and cadmium ions by synthesized nonocomposites. Consequently, 100 ml solution containing 5 ppm lead or 2 ppm cadmium and interfering ions in optimized conditions were placed in the vicinity with synthesized nanocomposites, separately. Tables 1, 2, 3, and 4 show the results of lead (II) and cadmium (II) ions removal beside interfering ions in the presence and absence of light, respectively. As is tabulated in Tables 1 and 2, the presence of interfering ions do not have any significant influence on the removal efficiency and lead (II) removal efficiency with Nd-TiO2/bentonite and Ce-TiO2/bentonite nanocomposites in the presence of light is more than the absence of light. As is clear in Tables 2 and 3, in all cases not only the presence of interfering ions, but also presence or absent of light have no significant influence on the cadmium ion removal efficiency by Nd-TiO2/bentonite and Ce-TiO2/bentonite nanocomposites. In optimum conditions, the removal process for lead and cadmium ions by Nd-TiO2/bentonite and Ce-TiO2/bentonite nanocomposites were repeated 9 times distinctly. The obtained relative standard deviation (RSD%) values are shown in Table 5. Consequently, the results have been satisfactory for lead ion removal by Nd-TiO2/bentonite nanocomposite and for cadmium ion removal by Ce-TiO2/bentonite nanocomposite. In order to study photocatalytic ability of synthesized nanocomposites, the photocatalytic reactor was used. The solution of methyl orange with a concentration of 5 ppm was selected as the organic pollutant and changes in its concentration in the vicinity of Nd-TiO2/bentonite and Ce-TiO2/bentonite nanocomposites was determined by UV-Vis spectrophotometer at 460 nm wavelength. The results in Fig. 10(a) and 10(b) show reduction of methyl orange concentration versus time. This indicates that, by using two synthesized nanocomposites for water treatment, not only heavy metal ions can be removed with a higher efficiency in the presence of light but also it can be used in terms of the decomposition of the organic pollutants in water. Combining these two abilities can decrease time and cost spent and consequently this will increase the efficiency of water treatment. To determine the mechanism and capacity of adsorption at constant temperature, the adsorption isotherms was examined as well. An equation which contains some constant parameters describing the surface properties and affinity of the adsorbent expresses an adsorption isotherm model. Among the available isotherm equations, the Langmuir and Freundlich isotherms were used in this study. Langmuir equation is usually represented by Eq 1. 1. All points are capable of homogeneous and uniform adsorption and have an equal adsorption. 2. Adsorbed layer thickness is the same at all points. 3. If molecules attract, one of the points has no effect on the adsorption of other areas. If the line drawn from the points was linear, then the adsorption mechanism has been based on the Langmuir model, otherwise, it would violate the model . and its linear mode is Eq. 4.
where n and Kf are Freundlich constants for a given adsorbent–adsorbate system that were obtained from the linear plot of lnqe vs. lnCe. Adsorption process follows the Freundlich model if the direction of the plot points is linear. Tables 6 and 7 show Langmuir and Freundlich isotherm constants in removal of lead and cadmium ions by Nd-TiO2/ bentonite and Ce-TiO2/ bentonite nanocomposites in the presence and absence of light, respectively. As specified in the tables, removal of lead and cadmium ions by both nanosorbents, in the presence of light is in line with the Freundlich equation while in the absence of light it is in accordance with the Langmuir equation. The primary and main target of this research is to provide a simple, effective, reproducible and inexpensive method to remove heavy metal ions. To this end, in order to study the effects of doped ion, Nd-TiO2/ bentonite and Ce-TiO2/bentonite nanocomposites were synthesized by the sol-gel method. After determining the structure of the synthesized samples, different factors affecting removal of lead and cadmium ions by these nanocomposites in the presence and absence of light were evaluated and optimized. The results indicate that in all cases, removal efficiency of both lead and cadmium ions with Nd-TiO2/bentonitein the presence of light is more than that the absence of light. The results, moreover, show that the effect of interfering ions is low in the process of removing ions by the synthesized nanocomposites. Besides, the results well illustrates that the method has perfect repeatability. In addition, in the present experiment the ability of sample nanocomposites were investigated to remove organic contaminants and as a result the synthesized nanocomposites not only have the ability to remove heavy metal ions by adsorption but also have the ability to decompose organic contaminants from water. 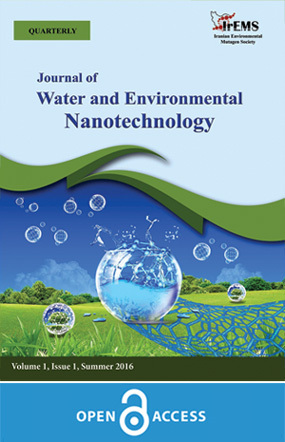 Consequently, synthesized nanocomposites can be used simultaneously from both adsorption and photocatalytic property in water and wastewater treatment. The authors are grateful to the Laboratory Complex of Yadegar-e-Imam Khomeini (RAH) Shahr-e-Rey Branch, Islamic Azad University for valuable technical assistance. 1. Adebayo, A.O., 2013. Investigation on pleurotus ferulae potential for the sorption of Pb(II) from aqueous solution. Bull Chem Soc Ethiop, 27(1): 25-34. 2. Sara vanan, D., T. Gomathi and P.N. Sudha, 2013. Sorption studies on heavy metal removal using chitn/bentonite biocomposite. Int J Biol Macromol, 53:67-71. 3. Ahmad, A., R. Ghufran andW. Mohd Faizal, 2010. Cd (II), Pb (II) and Zn (II) Removal from contaminated water by Biosorption using Activated sludge Biomass. Clean, 38(2): 153-158. 4. Bramat, M., 2007. Metal technology welding control and tests. El Coll De Boeck University France. 5. Grimshaw, P., J.M. Calo, P.A. Shirvanian and G. Hradil, 2011. Electrodeposition/Removal of Nickel in a spouted electrochemical. Ind Eng Chem Res, 50(16): 9525-9531. 6. Dabrowski, A., Z. Hubicki, P. Pod koscielny and E. Robens. 2004. Selective removal of the heavy metal ions from waters and industrial wastewaters by ion- Exchange method. Chemosphere, 56(2): 91-106. 7. Alfassi, Z.B. and C.M. Wai, 1992. Preconcentration Technique for trace elements. CRC Press Boston MA. 8. Eba, F., J.Ndong NLo, J.A. Ondo, P. Andeme EYi and E. Nsi- Emvo, 2013. Batch experiments on the removal of U (VI) ions in aqueous solutions by adsorption onto a natural clay surface. J Environ Earth Sci, 3(1): 11-23. 9. Anirudhan, T.S., S. Jalajamony and S.S. Sreekumari, 2012. Adsorption of heavy metal ions from aqueous solutions by amine and carboxylate furctionalised bentonites. Appl Clay Sci, 65-66: 67-71. 10. Lu, Ch. And H. Chiu, 2006. Adsorption of Zinc (II) from water with purified carbon nanotubes. Chem Eng Sci, 61: 1138-1145. 11. Samadi, S., F. Khalilian and A. Tabatabaee, 2014. Synthesis, Characterization and application of Cu-TiO2/chitosan nanocomposite thin film for the removal of some heavy metals. J Nanostruct Chem, 4(48): 1-8. 12. Khayet, M., J.P.G. Villaluenga, J.L. Valentin, M.A. Lopez-Manchado, J.A. Mengual and B. Seoane, 2005. Filled poly (2,6-dimethyl-1,4-phenylene oxide) dense membranes by silica and silane modified silica nanoparticles characterization and application in pervaporation. Polymer, 47: 114-122. 13. Shen, J.Y., W.T. Zhu, L.Q.Chen and X.P. Qiu, 2006. A nanocomposite proton exchange membrane based on PVDF, poly (2-acvylamido-2-methyl propylene sulfonic acid), and nano Al2O3 for direct methanol fuel cells. J Power Sources, 159: 894-899. 14. Han, P., H. Yahui, W. Yang and L. Linlin, 2006. Preparation of poly sulfone- Fe3O4 composite ultrafiltration membrane and its magnetic field. J Membr Sci, 284: 9-16. 15. Huang, H.G., J.H. Chen and L.C. Zou, 2003. Preparation and characterization of ZnO-PANI composite film. J Rare Met, 27: 91-94. 16. Bottino, A., G. Capannelli and A. Comite, 2002. Preparation and characterization of novel porous PVDF-ZrO2 Composite membranes. Desalination, 146: 35-40. 17. Trigo, C.E.L., A.O. Porto and G.M. De lima, 2004. Preparation and characterization of ZnO-PANI composite film. Eur Poly J, 40: 2465-2469. 18. Wu, Z., G. Suna, W. Jin, S. Hou Wang and Q. Xin, 2008. Nafion and nano-size TiO2-SO42- solid super acid composite membrane for direct methanol fuel cell. J Member Sci, 313: 336-343. 19. Zhou, H., Y. Chen, H. Fan, H. Shi, Z. Luo and B. Shi, 2008. Water vapor permeability of the polyurethane/TiO2 nanohybrid membrane with temperature sensivity. J Appl Polym Sci, 109: 3002-3007. 20. Mishra, S.P. 2014. Adsorption–desorption of heavy metal ions: a review. Curr Sci India, 107(4): 601-612. 21. Kabra, K., R. Chaudhary, R.L. Sawhney, 2004. Treatment of hazardous organic and inorganic compounds though aqueous phase photocatalysis: a review. Ind Eng Chem Res, 43: 7683-7696. 22. Prairie, M.R., L.R.Evans and S.L.Martinez, 1994. Destruction of organics and removal of heavy metals in water via TiO2 photocatalysis. In Chemical Oxidation: Technology for the nineties. Second International Symposium, Eckenfelder, Bowers, WW, Roth, AR, Eds., JA Technomic Publishing Company Lancaster Pa 428-441. 23. Anirudhn, T.S., S. Jalajamony and S.S. Sreekumari, 2012. Adsorption of heavy metal ions from aqueous solutions by amine and carboxylate functionalized bentonite. Appl Clay Sci, 65-66: 67-71. 24. Saravanan, D., T. Gomathi and P.N. Sudha, 2013. Sorption studies of heavy metal removal using chitin/bentonite bicomposite. Int J Biol Macromol, 53: 67-71. 25. Zhao, G., L. Chen, Y. Tang, L. He, B. Long, Z. Nie and H. Chen, 2014. Preparation of TiO2 photocatalyst loaded bentonite material and study of catalytic degradation. Mater Sci Forum, 809-810:860-866. 26. Aberoomand Azar, P., Sh. Moradi Dehaghi, S. Samadi, M. Saber Tehrani and M.H. Givianrad, 2011. Effect of CMC and HPC mixture on the photocatalytic activity of Nd-TiO2/SiO2 film 00under visible light irradiation. Turk J Chem, 35: 37- 44. 27. Samadi, S., 2012. Effect of HPC, PEG, CMC and PVP on the microstructure and photocatalytic activity of Nd-TiO2/SiO2 films under visible light irradiation. Asian J Chem, 24: 3649-3652. 28. Mahdavi, Sh., Jalali, M. and Afkhami, A., 2013. Heavy Metals removal from aqueous solutions using TiO2, MgO, and Al2O3 nanoparticles. Chem Eng Commun, 2013(3): 448-470. 29. Zhang, X.J., Ma, T.Y. and Yuan, Z.Y., 2008. Titania–phosphonate hybrid porous materials: preparation, photocatalytic activity and heavy metal ion adsorption. J Mater Chem, 18:2003-2010.